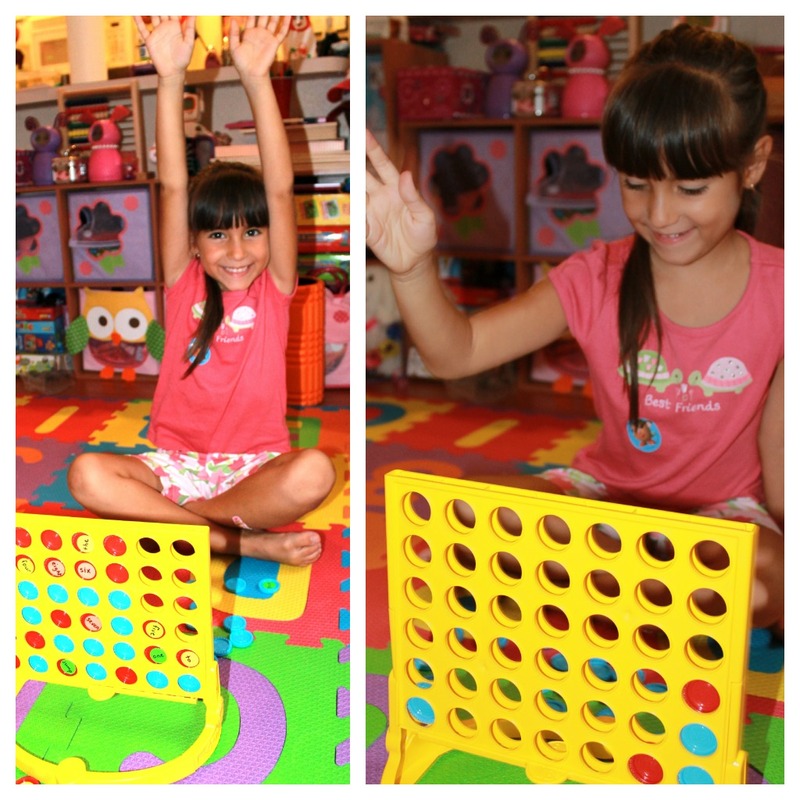 Do your kids enjoy board games as much as mine? Are they working on sight words, word families, letter/number recognition or another similar skills? If you answered yes, then I have another fun learning game to share with you today. Setting this up was super simple. We already had the game - Connect Four so all I did was use some dot stickers (I get mine from the dollar store!) 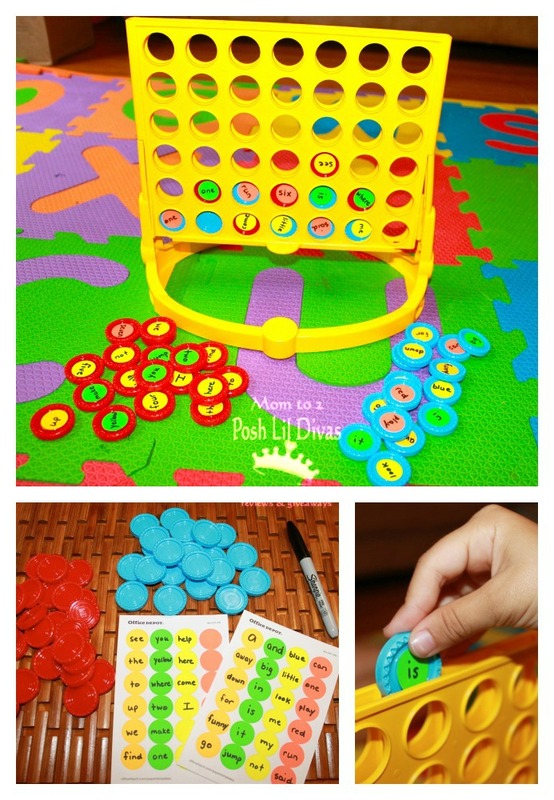 to write target sight words and stick them in the center of the playing pieces. I only put the words on one side (read why below). 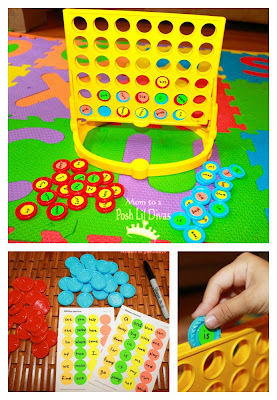 It's a quick and easy way to play and practice those sight words, letters, numbers, etc. 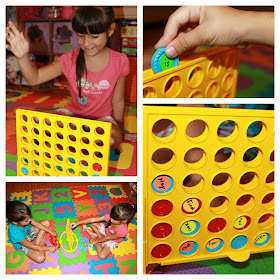 Play Connect Four as you normally would (trying to get 4 in a row) with the exception that before the child takes their turn they have to pick one of the playing pieces which are turned with the sight word stickers face down and read the sight word correctly before putting the piece into play on the game board. If the child gets a word wrong, tell them what the word is and have them return it face down and pick a new word. In order to play a piece, the player must first read a word correctly. I use words that are already mastered, words we are working on and even a few we haven't covered for variety. It give a nice blend of difficulty and ease to keep interest going and you don't have to re-do the stickers each time you play. Once the words have all been mastered I change out the stickers to add some new words. 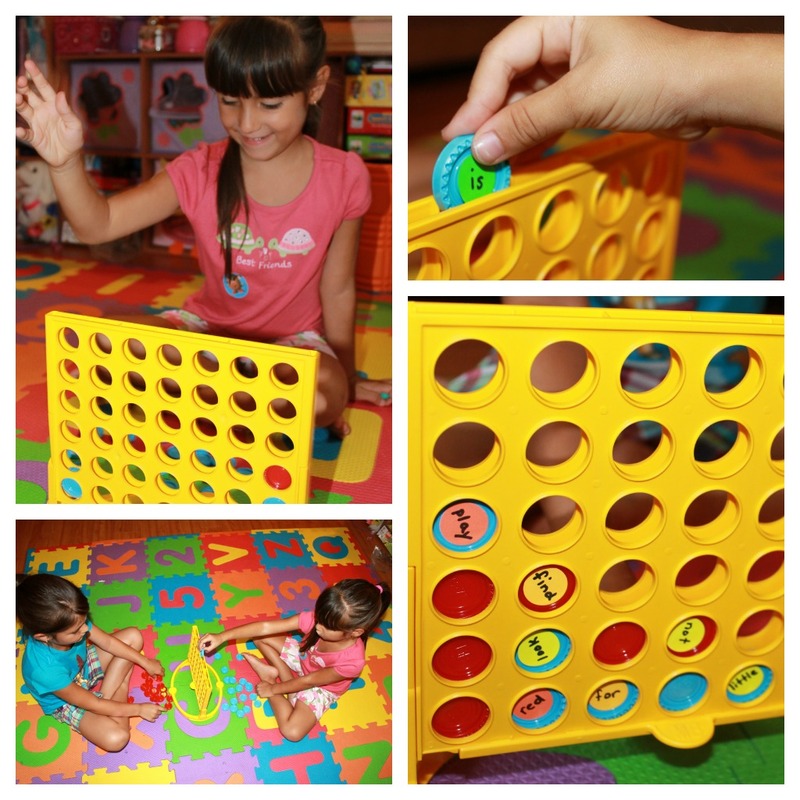 What do you think of Sight Word Connect Four? I think it's fun and easy to play which makes it perfect for the Littlest Diva and her big sis enjoys playing with her and helping her practice her sight words. Sight Word Connect Four has really been a hit here and I am sure it will be well received in your house or classroom as well. My preschool students love The Hungry Caterpillar Game to go along with the book http://www.brennaphillips.com/hungry-caterpillar-game Great for matching colors and shapes and counting. They have also played Hi Ho Cherry O but usually just end up putting cherries on the trees and taking them right back off again, haha. It turns into more of a fine motor exercise of grasping the cherries. But that's work too. I LOVE this idea!!! And very timely for our house! Thanks! We just played connect 4 tonight but I am going to add some sight words to the game pieces now! Wonderful Krisi! I have been sneaking in learning to most of our board games and it's really making a difference! Going to use this idea and adapt for math facts! Thanks! Leigh, yes math facts would be great with this as well. Enjoy. Leigh can you share how you did the math facts. I have one struggling with multiplication and would love some tips on how to do this. I am making this game tomorrow!! I teach PreK and can think of tons of ways to use your idea. Love it!! wonderful! I'd love to invite you back to share a few ideas with us. Such a fun activity! I LOVE Connect Four. Sharing on FB. I just made this with multiplication facts for my 3rd graders! They love to play connect 4 of Fun Friday so they should be all excited about doing this at a math center! Can you share how you do the multiplication facts with the connect 4? What do you do for the multiplication symbol? Do you mix facts or start out with only one of the facts? This looks easy to do! This is interesting. I never will have taught of this activity.I am teaching sight words now and this will be perfect for my class.Thanks!! What a wonderful idea. We don't have connect 4, but I may be able to convince the hubby to get it. Great idea! I can't wait to use this in my classroom and Thanks for sharing. Sounds like a great idea. I will try it. I put sight words on the ice pieces in Don't Break the Ice. Kids need to read the word before they can tap that piece out. I'm going to adapt this and use it for spelling word practice! LOVE!! Going to share on my Facebook page. Thank you!! Guys, just check out this page to learn how to write a critical essay.